The Caffeinated Collector: Episode 22 – Ship Shape Ships! Our journey begins, as it always does, with the original Star Wars line that ran from 1978 til 1980. Anyone who knows me knows what my choice is going to be for this line already, but you may be surprised that I actually had to debate with myself a bit. The Jawa Sandcrawler is a MAGNIFICENT toy, it’s radio-controlled, it has a ton of features, and it’s HUGE. It’s also one that I have never owned. It’s one of my grail items, I hope that someday I will have one in my collection. Had I ever owned one, this might have been an actual competition. But, I didn’t. So, it wasn’t. Of course, my choice favorite vehicle from this line has to be the Millennium Falcon. Has there EVER been a more perfect toy? It’s as screen-accurate as you could get in 1978, it had a holochess board, a remote training ball on a string, a gun that rotated, a satellite dish that somehow I never lost, a working loading ramp, AND it had a handle that allowed you to fly it around! As if that wasn’t enough, the back of the ship had a removable lid for easy access to the lounge area. The paint job on this thing is perfect, the landing gears even look real. It is, almost inarguably, the greatest spaceship toy ever created. I love this thing. I still have mine, and I still have the box. The Empire Strikes Back. My first love in cinematic terms, as well as toys. It’s also the source of much gnashing of teeth. I’m trying to decide which vehicle is my favorite. I’ve narrowed it down to three. First up, the AT-AT Walker. Oh. Em. Gee. How great is this toy? It’s the legged equivalent of the Falcon. Ridiculously screen-accurate, with features out the wazoo! Lights and sound from the cannons? Check! Opening compartment to put troops inside? Check! Poseable legs? Quadruple check! This was the toy that only the REALLY cool kids had, so of course I had one. It was HUGE and there was no end of fun to be had with this thing. It’s probably the most impressive of the vehicles up to this point. But it’s not my favorite. Next up: The Twin Pod Cloud Car. This vehicle is derided in many circles because of it’s “silly” concept of two single cockpits connected by an engine. It’s also scoffed at because of it’s orange paint job. It’s also totally awesome! Oddly enough, I’ve never met a person who actually doesn’t like it, so maybe its reputation hasn’t been earned. Either way, I love this thing. It’s a very “Star Wars-y” design and color scheme, it looks like it comes from another galaxy. At the same time it is entirely unique among Star Wars vehicles. It clearly was not designed for combat the way the Alphabet Wing ships or the TIE ships were, and I think that’s what sets it apart for me. I have every release of this ship, from the vintage to the prototype McQuarrie version to the mid-2000’s release that actually splits apart for some silly reason, and I love them all. The vintage will always be my favorite of the Cloud Cars, obviously. However, it isn’t my favorite ship from the line. Barely edging out the Cloud Car is the vehicle that got me in trouble with my dad. The Rebel Armored Snowspeeder is amazingly screen-accurate, and it shares a feature with the AT-AT: Pulsing blasters that light up and make lots of noise! It was this feature that got me in trouble. I got this thing for Christmas from Santa. I woke up early, found it, and immediately ran back to my parents’ room to show them. My mom was very polite, my dad, not so much. I believe his exact words were “If you don’t want that thrown against the wall take it back into the living room.” So, I did. And continued to play with it for years. My friend JJ had trouble with the name, he always referred to it as the “Rebel Omelette Snow Speeder” and I think this is what gave it the nod over the Cloud Car. A memory that brings a smile to my face is worth a lot, and that memory always makes me chuckle. Also, how awesome is the box art? I love the pink sky, it is what I most associate with the Star Wars box art of the era. When it came time for Return of the Jedi toys, Kenner was firing on all cylinders. They knew they had a hit on their hands, so they pulled out all the stops and gave us some of the greatest toys ever conceived by the mind of man. Believe it or not, it took until this point for us to get a Y-Wing fighter. It’s a great ship, but it’s not nearly as cool as the B-Wing. The B-Wing gave us our first rotating cockpit, so that the pilot was always right-side-up, regardless of the orientation of the ship. The wings flipped out, and it was a sturdy toy. Alas, it was to be eclipsed by something even greater. Return of the Jedi opened with an Imperial Shuttle emerging from a Star Destroyer. The wings folded up when it landed!! It was sleek, it was dynamic, and it was AMAZING. Even more amazing? Kenner managed to recreate this vehicle on the 3 ¾” scale! Gaze upon its glory. When I was a kid, I would have sworn this was just a recreation of the model they used in the film. It was huge, and the box was even bigger! 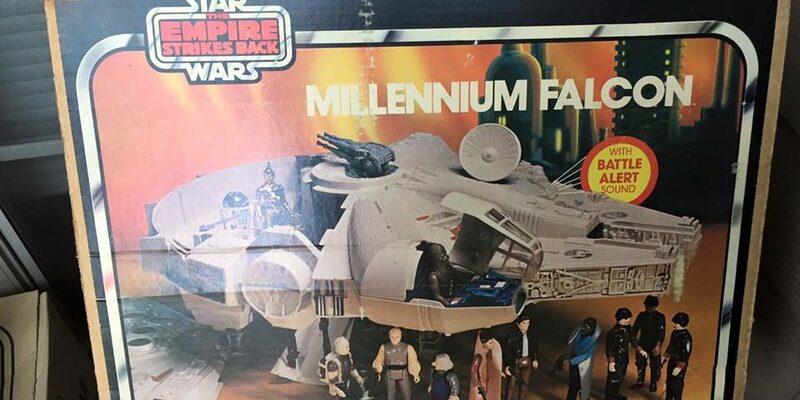 Like the Falcon, this ship had a loading ramp for you to walk your figures up, and you could fit as many as six figures inside! The wings folded down, the guns turned, and it had a handle like the Falcon as well! I loved this toy, and even though it came near the end of the line, it got played with just as much as all the previous ships in my collection. By the time The Power of the Force came around, we had gotten most of the ships from the films, and they were all outstanding. One ship we did NOT get was the A-Wing fighter. And we didn’t get it now. It wouldn’t be released until the Droids cartoon got a toy line, so it was not in the running for this list. Which is just as well, since I never owned one (and still don’t, YET! ), so it wouldn’t have been the choice anyway. No, the one vehicle we got that we NEEDED was the Desert Sand Skiff from the beginning of Return of the Jedi! I got this from my brother for my birthday, and it is still one of the coolest birthday gifts I’ve ever received. It has a plank for Luke to walk, and the rudders are moveable. Beyond that, there wasn’t much to it, other than a very intricate design and a screen-accurate paint job. There was plenty of room for your figures to commiserate on the deck, and, oh yeah, there was a panel that would allow you to EJECT A FIGURE INTO THE SARLACC!!!! Very handy for that pesky Boba Fett action figure. A great gift, and a great toy, and my favorite vehicle from this part of the line. This entry in the series was a bit longer than previous blogs, so I thank you for your indulgence. What are some of your favorite vehicles from the line? What is your criteria for what makes a great vehicle? Please share in the comment! Up next: BEASTS!!!! Stay tuned! Jeff can be heard weekly on Assembly of Geeks (www.assemblyofgeeks.com) and on his own podcast network, MarvinDog Media (www.MarvinDogMedia.com) where he hostsThe Pilot Episode, Talking Toys with Taylor and Jeff, and Bantha Banter: A Star Wars Chat Show. He is also co-host of Comics With Kenobi with fellow CWK blogger Matt Moore, and part-time co-host for Coffee With Kenobi, which you have already found if you’re reading this blog. You can contact Jeff at jeffm@coffeewithkenobi.com.